Watches are one of the most common jewelry accessory. 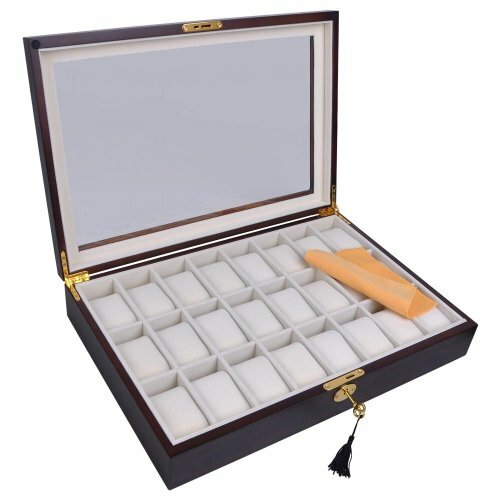 A high class Watch Display Case will organize your watches and keep them clean from dust. This top class Wood Watch Display Case with Matte Finish is a must addition to any watch collection. A perfect gift for anyone! * Top class workmanship and material. * Tastefully protects, stores, and organizes up to 24 watches. * Velvety Plush Lining builds up an elegant atmosphere besides best protection. * Removable, Plush Pillows make room for other accessories. * Hinged Door with Scratch-resistant Glass top provides ease of access and dramatic display. * Additional non-slip velvet on the corners and the base for less wearing. * Elegant lock and tassel key offer increased security. * All Metal Parts are in Golden finish with sleek hand feel. * Fit for most Wrist Watch.